This is the view from atop the WWI Memorial in Kansas City. 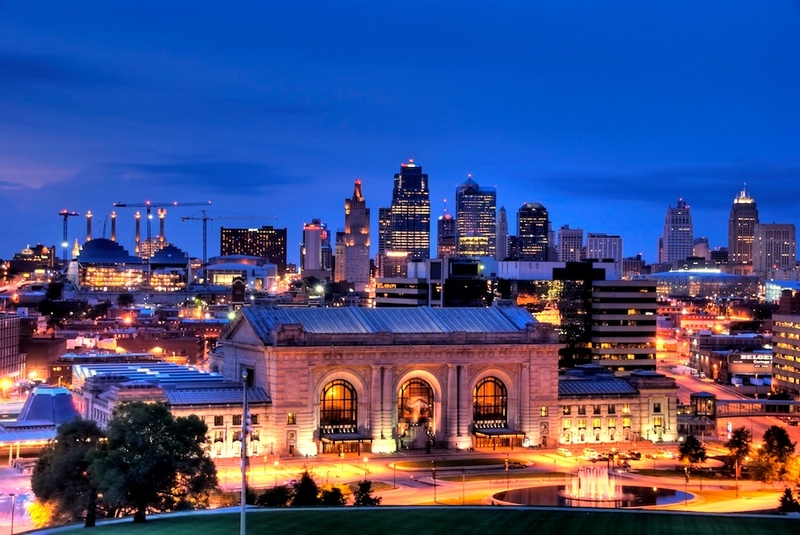 I had read about this spot before going to KC, and that it offered a fabulous view of the city. I was not disappointed. It really is a wonderful view. The large building in the foreground is Union Station, their historic train station which now also houses a museum, a post office and some eateries. It's cool. I got to this spot while it was still pretty light out, and basically hung around until darkness settled on the town. I have tons of shots from up here, some closely focused on Union Station such as this one, and some offering a broader view of the town. I'll be sure and share them all in due time. Hope you enjoy the photo as much as I enjoyed sitting up here and taking it! This is a 5 exposure HDR taken at f/10 into fading light, with exposures from -4 to 0. I merged them in Photomatix to create the HDR and then made some adjustments in Aperture.